Discussion in 'Android Apps & Games' started by evolvegames, Apr 30, 2017. 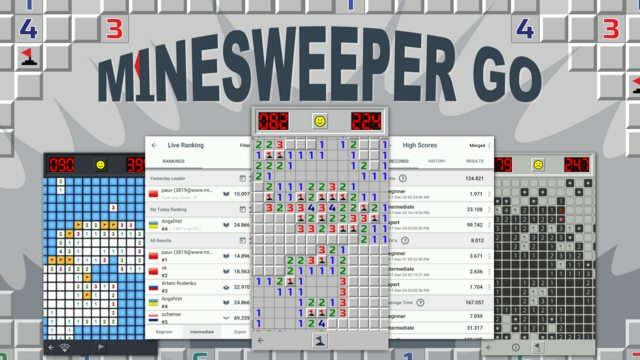 Minesweeper GO is an unique reincarnation of classic windows minesweeper game. It brings on mobile platform a lot of advanced features that were earlier available only on desktop minesweeper clones used on minesweeper championships. Notable ones are gameplay video recording and calculation of advanced game metrics. Enjoy a lot of bug fixes and improvements! And a lot of bug fixes and improvements! Introduced Rank system. Now players will achieve game ranks by demining minefields. The higher the rank of the player, the more he is respected in the world of minesweeper. After six months of initial beta release Minesweeper GO has came a long way and at last released to public. I am very grateful to all of you for support and testing. While playing minesweeper sometimes you'll get to that point that you can't move forward by using logic so you'll have to pick squares randomly. This update brings some unique features that will help you resolve or completely avoid such annoying situations. Magic Wand of Luck. Depending on the state of target square after magic wand is charged appropriate action will be applied: flag will be set if there is a mine or square will be uncovered if it is safe. This is powerful tool so to keep balance you no longer have any excuse to make a mistake. You will lose instantly if try to use magic wand while any logical solutions exist. Guess Free mode. In this mode logical solution is guaranteed for any minefield. You can turn on guess free boards in game settings. Smart Hints. Smart hint shows you tile configurations with safe squares that can be uncovered given the current state of the board. They not only indicate safe squares but also explain why they are safe. The mechanism of generating hints doesn't have access to yet uncovered squares. It only knows as much as a player knows. I played this game a lot on my pc, it's a good idea to be able to have it on your smartphone that reminds of good memories, i like it. This update introduces new game mode - minesweeper online Tournament. Now you can compete with your friends online, or with any player around the globe. To win tournament you must complete one or more game rounds before any of your opponents. There are three difficulty options that you can choose to play (Beg, Int, Exp). Up to 9 players can compete simultaneously. All participants play the same boards in the same order. Earn points, gain experience and collect cups. Have fun!